If this is a gift, please remember to check the This is a gift checkbox. In order to provide a more accurate delivery, please ensure that an exact delivery date is selected. 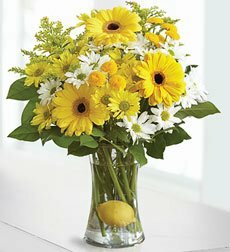 In honor of the graceful, lemonade-making optimists of the world, may we present this joyful, bright bouquet of yellow Gerbera daisies, alstroemeria, daisy poms and more, designed in a striking glass gathering vase.